Tadalafil is a PDE5-inhibitor for the treatment of erectile dysfunction (ED). This inhibitor promotes relaxation of blood vessels and increases blood flow to certain areas of the body. 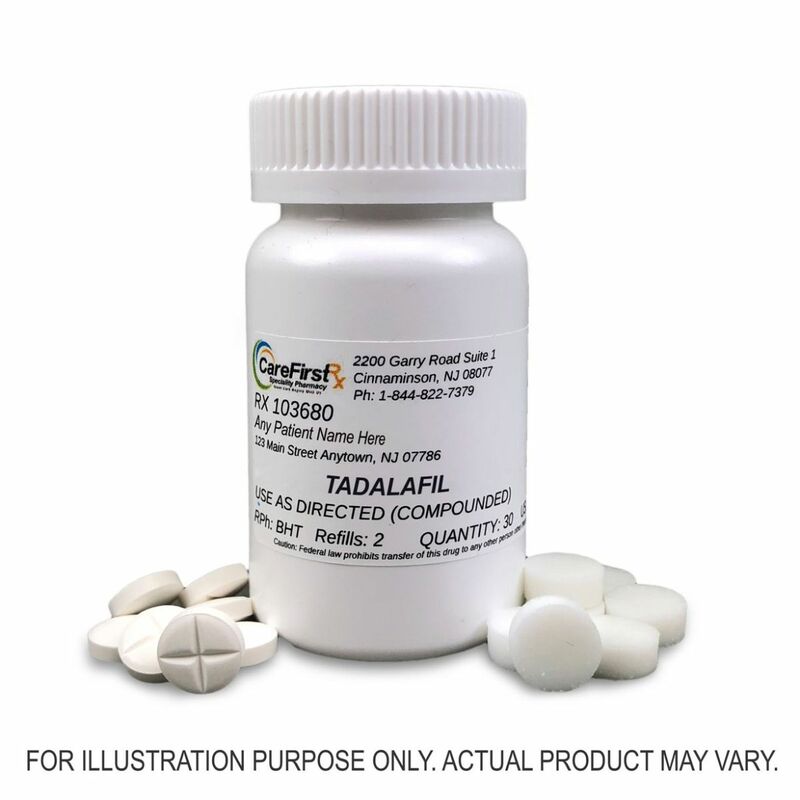 We can compound Tadalafil as a Tablet or a Lozenge. Free shipping only applies to Tablets. What are Sildenafil and Tadalifil? 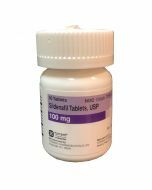 Their generic names are very similar because they are both PDE5-inhibitors for the treatment of erectile dysfunction (ED). These inhibitors promote relaxation of blood vessels and increase blood flow to certain areas of the body. The main difference between the two medications is how long the drugs work in the body. Both medications begin to work within about 30 – 60 minutes. We compound these medication as a troche/lozenge or Quick Dissolve Sublingual Tablet. Troches and sublingual tablets are a unique dosage forms that have been used for many years for drug delivery. Troches are small lozenges that dissolve between the cheek and gum over a period of about 15-30 minutes. 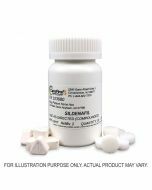 Sublingual tablets can be quickly dissolve under the tongue. The medication is then directly absorbed through the mucus membranes of the mouth and are effective because the lining of the mouth is thin and rich in blood supply. As it dissolves, the medication is gradually absorbed directly into the blood stream. Because of the medication is absorbed through the mucus membrane, the medication avoid the digestive process. Tadalifilis a once daily medication that will work longer in the body, sometimes up to 36 hours.Tadalifil is also used to treat ED and benign prostatic hyperplasia (BPH). 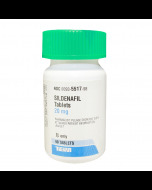 Sildenafil is a once daily medication taken when needed 30-60 minutes prior to sexual activity. It lasts for up to 4 hours. If one medication does not help treat your ED, it is unlikely that the other would work, as they function very similarly in the body. Pre-existing conditions, risk factors and goals of therapy are the main reasons that physicians and patients choose one instead of the other. It is important to discuss your medical history and current problems with ED with your physician before deciding which is right for you. How to place the troche in your mouth. When you are ready to put a troche/lozenge in your mouth. Place the troche up against your gum and cheeks. Gently push the troche as deep as it will go between your cheeks and gums. Take your finger out of your mouth and push on the troche from the outside of your cheeks for at least 30 seconds. The troche should stick to your gum. It is okay if it sticks to your cheek instead of your gum. Wash hands after administration. This is commonly referred to as buccal administration. DO NOT CHEW or SWALLOW the troche. Rotate the area in the mouth where you place the medication for each dose. This will reduce the risk of mouth irritation. It usually takes about 15-30 min for the troche to dissolve. Do not drink, eat or brush until your dose is dissolved. This will help to keep the medication out of the digestive tract. To maintain a consistent blood level, you should take the medication at the same time every day. The tablet can be places simply under your tongue, also referred to sublingual administration. This tablet can also be placed up against your gum and cheek (buccal administration) similar to a troche.